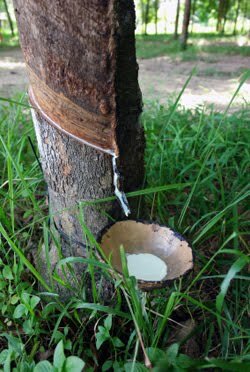 Physical rubber prices declined further on Tuesday tracking the weakness in the domestic and international rubber futures market coupled with the expectations of an improvement in local supplies due to favourable change in weather. Though the markets witnessed a rather dull session but there was no selling pressure as well. Spot price for RSS-4 variety closed at Rs 165 compared to its previous closing of Rs 167 while RSS-5 variety closed at Rs 161 compared to its previous closing of Rs 162.50. In the futures market contract for September delivery for RSS-4 weakened to Rs 166.29 compared to its previous closing of Rs 168.17 while the contract for October delivery closed at Rs 163.16 compared to its previous closing of Rs 164.17 on the National Multi Commodity Exchange.